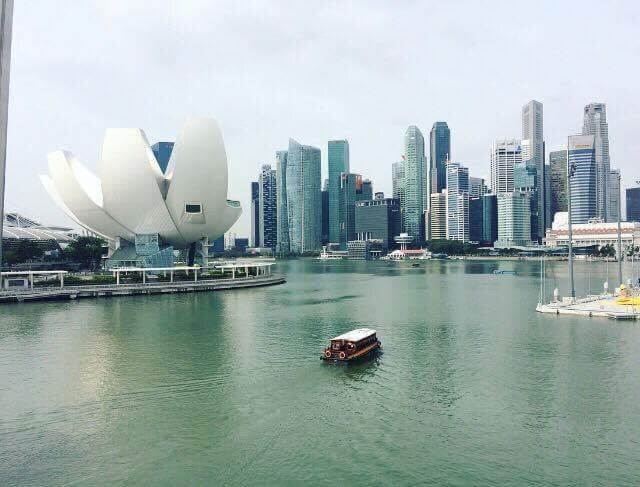 Singapore was the first stop on our ten-month journey away from home. Esmé was around 12-weeks old when we arrived. Being an extremely clean city, it was a great starting point with a newborn. It is also regularly used as a layover destination when flying from Europe to places like New Zealand and Australia. 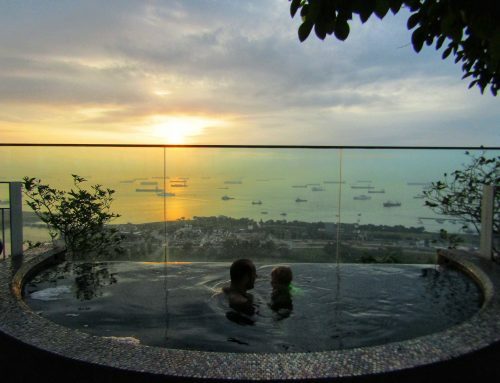 I really wanted to visit Singapore with a baby since a friend of mine showed me his photos of the incredible infinity pool at the top of the iconic Marina Bay Sands Hotel. Although I knew it was going to be super expensive, I decided we deserved a treat. My 30th birthday was a couple of months previous and I was two days overdue with Esmé so partying was out of the question. That’s a good enough excuse, right?! I otherwise didn’t have high expectations of Singapore. Mainly because I knew it was a small place and often used as a connection hub. My expectations were blown out of the water! It was a great introduction into travelling with a baby and we really enjoyed our time there. 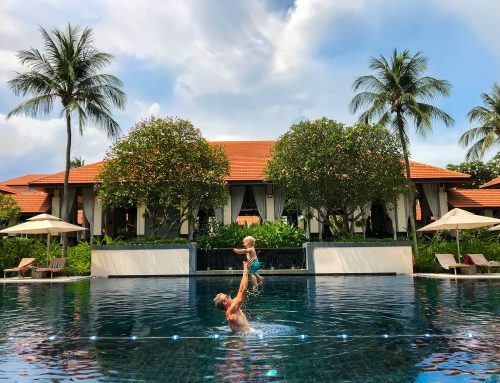 In my usual format, here is where to eat, sleep and play in Singapore with a baby. We predominantly ate at the street food markets in Singapore. It was really affordable and there were many options to choose from. There are many markets on at different times of the day with lots of seating along closed-off roads. In the background you can see steam coming from BBQ’d food and woks tossing tasty noodle dishes! There are many Singapore dishes to try but chilli crab seems to be the most popular. Esmé was too young to eat at the time when we were in Singapore. However there were plenty of western supermarkets with baby food, fruits and vegetables. There were also plenty of restaurants serving European food in case baby prefers more subtle flavours. 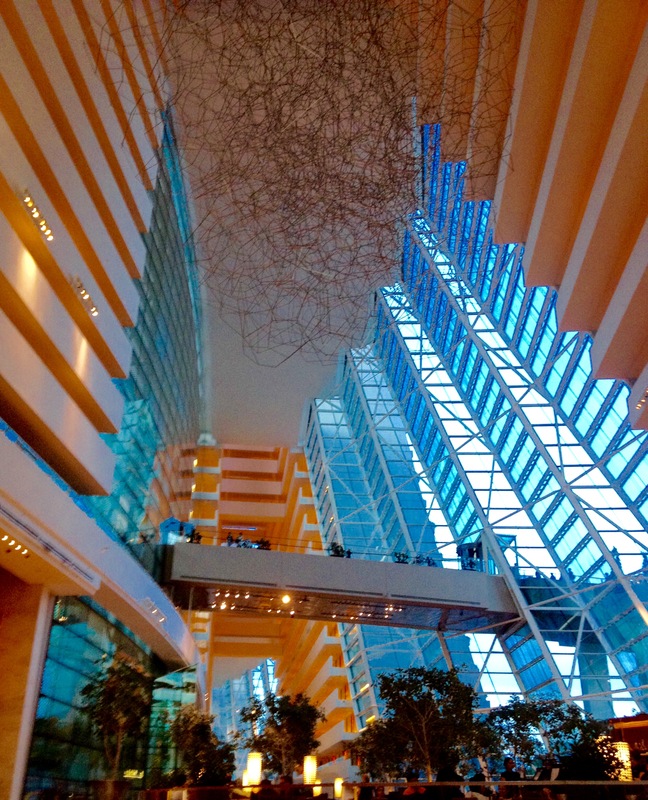 As mentioned, we treated ourselves with a stay at the fabulous Marina Bay Sands Hotel. It was quite expensive but totally worth it as we don’t normally splash out like that. We booked a superior room with views of the marina. From the moment we drove into the main city in our taxi, the hotel dominated the landscape. 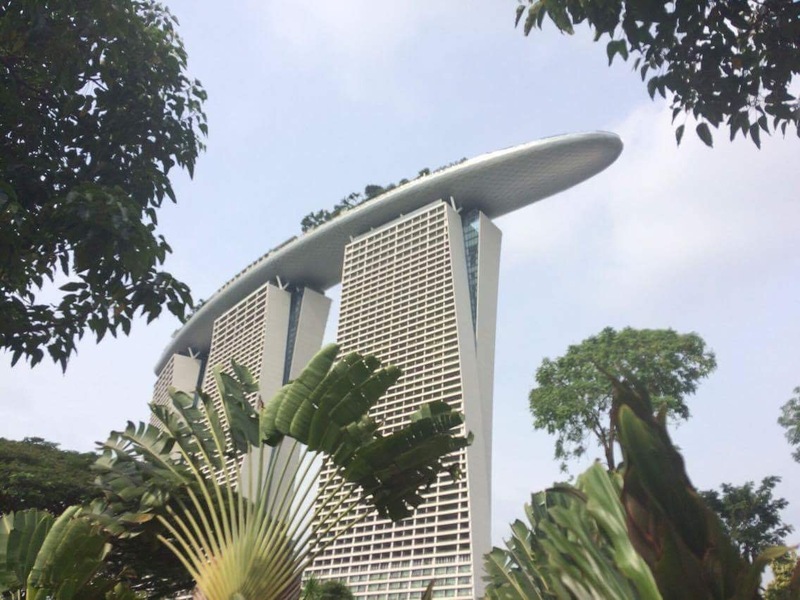 Marina Bay Sands is the most iconic building in Singapore. The hotel comprises of three 55 story towers. It is topped with a Sky Park that spreads across all three towers. The Sky Park has one of the most incredible infinity pools in the world. It stretches the length of the entire roof top and drops off into the city below (or at least it looks like that). Apparently the building was inspired by a deck of cards which may account for it housing the largest atrium casino in the world. We felt like royalty from the moment we pulled up in our taxi outside. Porters helped us with everything and we were greeted with a cold drink on our arrival. The check-in was smooth and quick considering the sheer size of the place. The foyer is incredible, an architectural wonder. Our pad was on the 35th floor. Walking into the room, it definitely had the ‘WOW’ factor. It was a fusion of ‘feng shui’ design, some serious mod cons and the most stunning view! We could open and close the curtains with the press of a button by our bed. The bathroom had the biggest bath you have ever seen, a walk in shower and the smellies were to die for! There was plenty of room for a cot and our luggage. There are several high-quality restaurants within the hotel ranging in style. They are all on the pricey side so we mainly ate outside. There is a massive shopping centre with a variety of shops and the hotel is also connected to the downtown circle line which is really handy for going out to explore. The best part of the hotel is the roof top Sky Park. We spent so much time by the pool on the loungers. There were plenty of shaded areas for baby and the water was a nice temperature to take her for a dip. There was also a jacuzzi, a restaurant and a bar. The cocktails from the bar were amazing, the whole experience was really special. The views are spectacular and worth a visit at different times throughout the day sunrise/sunset and evenings to see all the twinkly lights of Singapore! 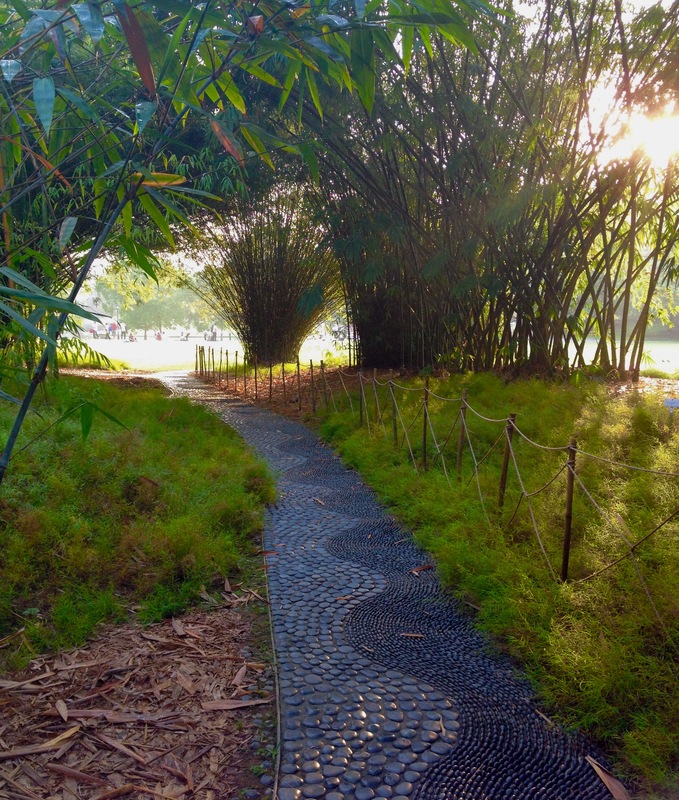 Our favourite activity in Singapore with a baby was a sunrise walk through the botanical gardens. We were jet lagged and woke up at 4am. Travel Mad Dad looked up things to do and found the gardens were the perfect place to go at that time. We took a taxi from our hotel, as we arrived the sky became a glowing orange colour. The air was cool at that time so it was a lovely temperature to walk around in with a baby. We walked through what felt like rain forest seeing many ancient trees of all shapes and sizes. There are pretty lakes and what we really loved were all the locals practising Tai Chi. It was so peaceful to watch. After a full lap of the gardens, we stopped by the Food for Thought Restaurant near to the exit gate. They had great reviews for delicious breakfasts onnline and it didn’t disappoint! There was a great selection of cooked and cold breakfast. The pancakes seemed to be the most popular choice which I tried. There is a little playground just outside for babies that are a little bit older. 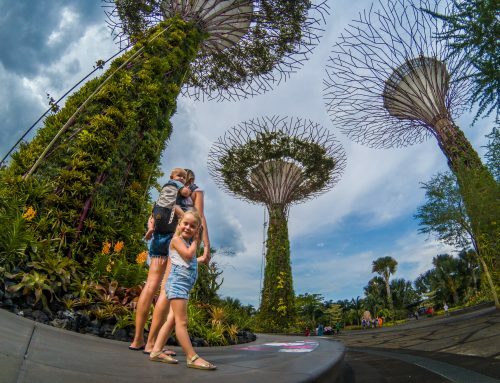 If ever there was a great place to take a 12 week old baby, it’s the Garden by the Bay in Singapore. In truth, there aren’t many things you can do with a newborn baby to stimulate them when travelling. The garden is a visual sensory overload for a person of any age. Its like a scene from avatar. Its best to visit in the evening time when the full extent of the lighting can be seen. There are many tree like structures that are actually a vertical garden. They are connected with a canopy walk which is a lovely stroll. Its best to baby wear rather than use a buggy. There is also bar /restaurant in one of the tree tops which is worth a visit. They were quite happy to have us with a baby. When I heard the Marina Bay Sands ran a yoga class in the Sky Park at sunrise, I could not resist! Obviously this was some time out for me, it wasn’t a mummy and baby class. However, as it was so early it was easy for me to sneak away from Travel Mad Dad and Esmé for an hour. When I arrived at Sky Park the horizon was like a colour palette. There was no one else around accept those attending the yoga class. We rolled our mats out on the deck and it was one of the most relaxing classes I have ever been to. Being 55 floors up, I felt so removed from the hustle of a city. The teacher was really good and took account of the fact I was not too long post-partum. I strongly recommend attending if you are staying at Marina Bay Sands and love yoga! Chinatown is quite different from the rest of Singapore. It’s a stark contrast from the modern skyscrapers. Chinatown is filled with beautiful historical buildings, narrow streets and colourful markets. 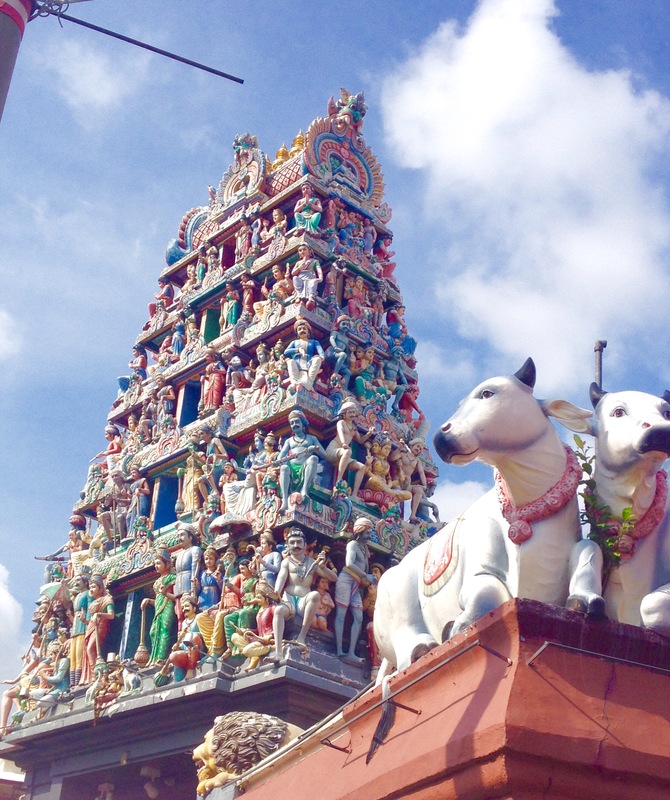 There are plenty of Buddhist and Hindu temples to explore and the architecture is certainly beautiful to photograph. It’s a nice place to have lunch and explore for an afternoon. The area was perfectly ok to explore with a buggy. Lazarus Island is just a 30 minute ferry-ride from the Marina in Singapore. It’s a lovely escape from the city with its lush white sand beaches. There are no shops in the area so make sure to bring all you need if you intend to go. I would also suggest using a baby carrier for ease. 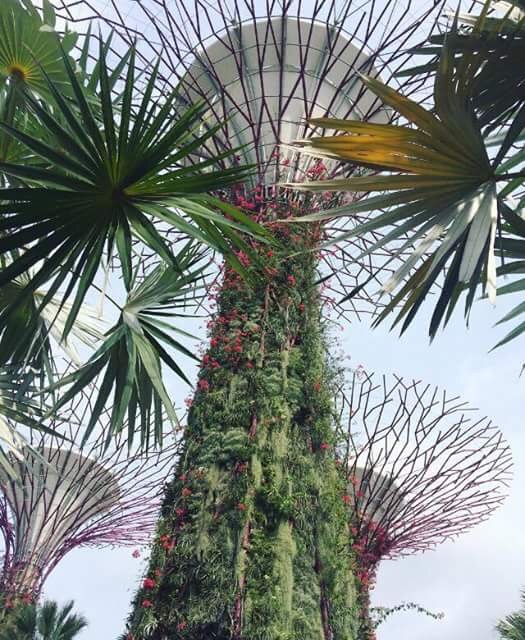 For more information on the best places to visit in Singapore visit our friends over at IMVoyager. 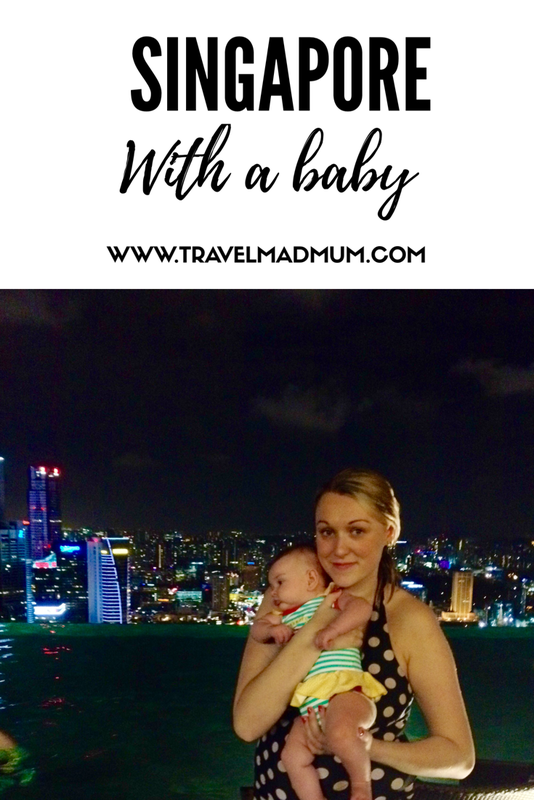 Have you been to Singapore with a baby? Or maybe you have a question? Leave a comment below and I will get back to you as soon as possible. Wonderful! 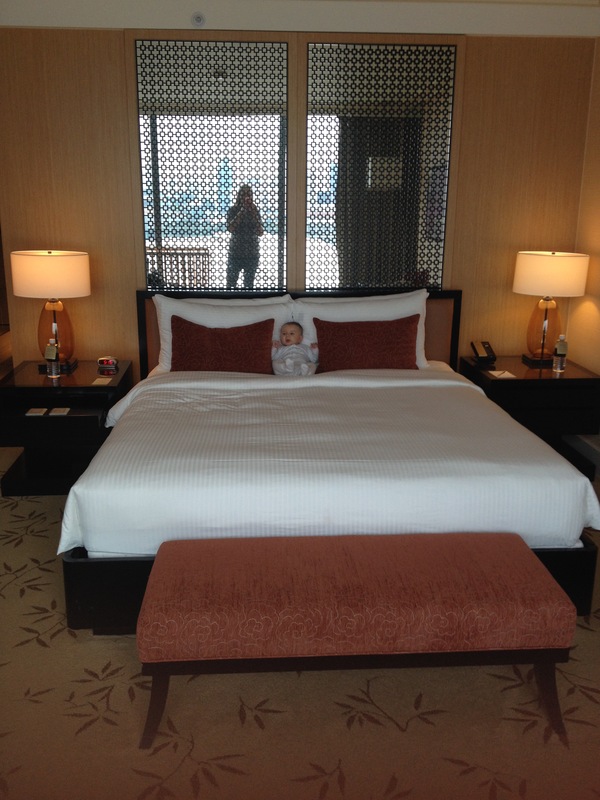 I have been in Singapore while pregnant but I do travel with my baby all over the world!! It’s amazing to see people like you! Hi, how old your child was when you were in Singapore? We spent 3-4 days un Singapore I think. Hi Karen, did u use a buggy when the baby was 12 weeks? I thought kids could not sit in a buggy till they are more than 6 month old and can sit on their own. I’m bothered if I should get a buggy if I’d like to take my 12 week kid to travel. Any advice please? Hi didn’t u visit universal studios and dentist island with ur little one ? Hi. How did you get around Singapore? If travelling by taxi or Uber, were you required to have a carseat? Hi transport/getting around has been my biggest concern about travelling to Singapore with a baby. Can you please explain a bit more about how you got around? Did you bring your own car seat and connect it into the taxi every time? How does that work? what about vaccinations? Were you concerned about the baby getting sick? Only because I’m considering traveling for a week to Singapore with a 3 month old boy. No my doctor told us baby can’t have travel specific vaccines. Our baby was only allowed the routine ones. did you take a car seat when you travelled or did you get a car with baby seats? Great article! Were thinking about travelling from the UK to Singapore with my 6 month old baby but worried about the time zone adjustments. How did you manage with your babies sleep routine disrupted?